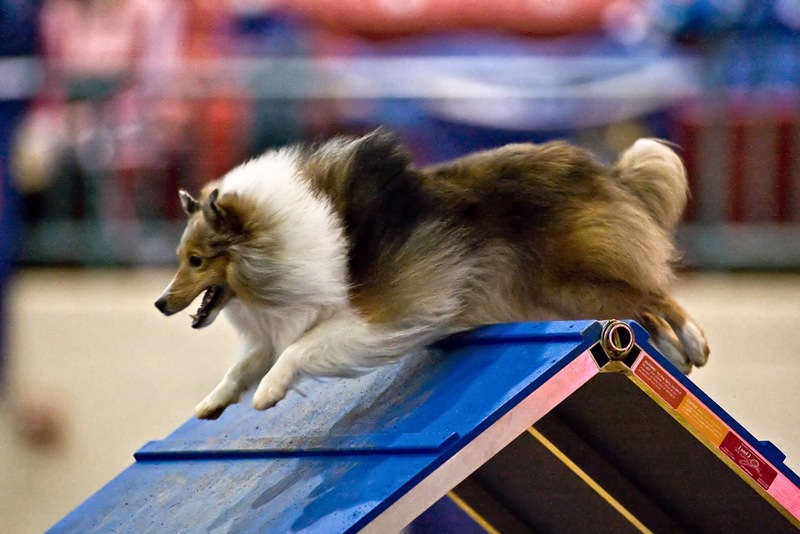 As a competitor, Brittany has enjoyed success with all of her Shelties. She has earned multiple championships in both AKC and USDAA, starting with her very first dog and agility partner, Shiner. She has competed in every AKC National Agility Championship since 2007, with numerous appearances in the Finals and Challenger Round. She has also been to the AKC/USA Agility World Team Tryouts, and the European Open Team Tryouts many times, with Trip and Trek. As a veterinarian, Brittany brings a unique skill set to her agility training and teaching. Her Sheltie, Ticket, underwent Tibial Plateau Leveling Osteotomy (TPLO) for a torn cranial cruciate ligament (CCL). Brittany has blogged about the experience, from surgery to rehabilitation, to provide other competitors with insight that might be helpful for their own injured dogs. She has taken coursework in canine rehabilitation at the University of Tennessee, and hopes to finish her CCRP certification in the future. She is also certified in veterinary medical acupuncture, and has a strong interest in pain management, and sports medicine. Like many trainers, Brittany has evolved through the years. She believes in starting agility dogs by building a solid working relationship through positive reinforcement. Using clicker training and motivational techniques, Brittany strives to produce fast, enthusiastic workers. She thinks that with this foundation, and by maintaining clear criteria, all different types of dogs can be successful in agility. She currently utilizes many of the training methods developed by Justine Davenport and Jessica Patterson, of Shape Up Agility Dogs. 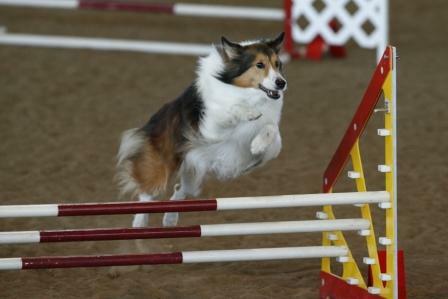 When she started in agility, Brittany struggled with high expectations and ring nerves. Oftentimes with a Double Q on the line, she would feel physically ill walking into the ring, and frustrated and disappointed if she didn’t qualify. When she started to trial Trip and consider events like Nationals and World Team Tryouts, she realized she needed to do something to improve her mental game. Lanny Bassham’s book With Winning in Mind changed the way she thought about goals, and competition, and has helped her develop a new outlook in trials and at major events. Trip is my heart and soul. She is the dog that all future ones will be compared to. I’ve never had the pleasure of training a dog who was so easy–she just GETS everything. She has taken me places I have only dreamed about going (National Finals, World Team Tryouts), and left me hungry for even more. She has inspired me to expect more of myself, and to strive to achieve what a few years ago I would have thought were unattainable goals. Trip has attended each AKC National event since 2008, making the Finals in 2009, 2015, and 2016, and the Challenger Round in 2010. She has also attended World Team Tryouts 2009-2011, and 2013. In 2009, Trip had a litter of 3 beautiful puppies who are also now competing in agility–Rugby, Rush, and Ticket. She currently competes in the Preferred 8″ Class, and will be attending her 10th AKC Nationals in 2017 at almost 12 years of age. Ticket is nothing that I expected, and everything I could have hoped for. When I bred Trip, I was really hoping for a little Trip-clone. The reality of what I got is nothing like her, but I adore everything that she is. Ticket is crazy and fun-loving, but she adores working with me and agility like nothing else. She gives 1000% to every activity, but is also the sweetest of all of my dogs. Ticket was sidelined with a partial CCL tear and underwent a TPLO surgery in the Fall of 2011. Unfortunately, about a year later, she tore the CCL on her opposite side as well. This time surgery did not go as well, and she ended up having 7 surgeries in 12 months in an attempt to repair her leg and allow the bone to heal following the TPLO surgery. A last ditch effort was made with a fairly novel treatment in canines, and her leg finally healed. After two years of surgeries and rehab, Ticket finally returned to the agility ring in November 2014, 2 years after the initial surgery on her right rear leg. 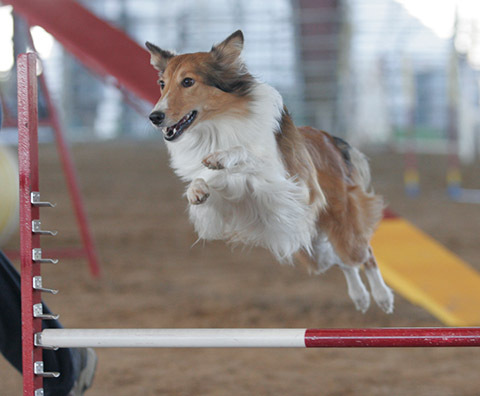 She now competes in the Preferred 12″ class, and still runs with as much enthusiasm as the first time she saw an agility course. She finally competed at her first AKC Nationals in 2016, and made the Challenger Round. She also competed in the 2015 Westminster Agility Trial, making the Finals and finishing 3rd in the 16″ class. Trek is easily the smartest dog I have ever owned, and also the most challenging. She learns everything quickly, but repeat something a few times, and she starts experimenting to see if you want something different. I have also had to work harder then I ever had previously to build a working relationship with her. While she is extremely food motivated, she does not find toys as motivating as agility itself, so learning how to effectively reward her in agility was at first a challenge, and we struggled with motivation and speed. She is a dog who always questions “why,” and I had to alter my training to keep her excited and focused. That said, she has proved to be more precocious then even Trip. She qualified for her first AKC Nationals at 2 years of age, AND made the Finals, finishing 6th. She attended her first World Team Tryouts at 19 months old, and she finished her first MACH at just over 25 months of age. Her training and handling are everything I could hope for, and I feel like we can run any course cleanly. Mardi was my first failed foster attempt. I was fostering dogs for Louisiana Sheltie rescue, and she was an owner surrender. She was too busy, and she barked a lot, especially alone in the backyard. The first thing I noticed was how similarly marked to Shiner she was, though she was lighter in color. When I brought her home, she immediately found a toy and asked me to tug with her. I knew she needed a home with a job, and she was almost adopted the first week I had her by a great family with owners who jogged a lot. After that, no one was really interested. I tried to sell my agility friends on what a great dog she would be, but no one was looking at the time. Finally, my husband and I decided to keep her. She was supposed to be his agility dog, though that never quite worked out. Mardi was always eager to please, happy to play with toys, and excited to work. Her rescue “baggage” made her difficult to live with at times (she was a compulsive barker, and she hated my cat), but agility was never a problem. Mardi took me to my first agility National Championship, and really taught me how to handle a fast dog. She also illustrated to me the importance of maintaining criteria. Mardi retired in November, 2009 when chronic elbow issues made weaving and jumps difficult for her.